I loved reading about Kelsie’s birth! Just goes to show that even when your birth turns out nothing like you expected, it can still be amazing and empowering! I just wanted to say thank you for everything you taught us in the Hypnobirthing class we took from you and let you know how everything went. My baby girl, Ember Jeanne, was born February 21 (41 weeks) at 2:07 AM weighing 7lbs 1oz, 18 inches long, at Orem Community Hospital. The whole labor/birth experience was not exactly how I expected or planned but I am happy with how it all turned out. Since I had gone past my “due date” I was more than anxious to meet my baby so I decided to try some castor oil to induce my labor as I did not want to be medically induced which my midwives were planning on doing a couple days later. I took the oil at 5 pm on Thursday the 20th, started regular contractions at 9 pm, went to the hospital at 11pm and she was born Friday morning at 2:07am. When we got to the hospital, I was not in “pain” like I expected to be but the contractions were 3-5 minutes apart and had been for 2 hours. Knowing I have fast labors and not wanting to have the baby in the car on the way or at home, we decided to go in and have everything checked out. When we got there I was only dilated to a 3 and after an hour I hadn’t made any progress and the nurse said my options were to go home or have her break my water. I told her I didn’t like either option and wanted to stay and have my baby. By then, my contractions were very intense and I was getting frustrated because the monitor wasn’t picking up any of them, so it didn’t even look like I was in labor to anyone else. About midnight, I was very sick from the castor oil I had taken which made it that much more uncomfortable. I forgot to mention, since we weren’t sure if baby was even coming yet, we left EVERYTHING in the car. Camera, IPOD, Hypnobirthing supplies. So I was on my own. No relaxation techniques other than trying to keep my mind calm, and no camera to document this wonderful baby’s journey to this life. I could have sent my husband out to get my things but I wanted him to stay in the room with me. After what seemed like forever of “holding in” my baby, I asked if I could resume pushing. They told me to follow whatever my body was telling me and a few pushes later, the head came out along with another blast of amniotic fluid all over the room. The first shoulder and rest of the body slid out right after and the nurse quickly handed me my baby and I looked and saw that I had a little baby girl (we hadn’t found out the gender yet). I was so overcome at that moment from what I had just accomplished and the tiny baby in my arms. After trying but failing to have my first baby without an epidural, I didn’t think something like this was possible for me. I feel like even though I didn’t have the Hypno birth I had planned and expected, I still accomplished what I had always wanted; to have a baby unmedicated. Your class definitely made me feel empowered and gave me the confidence I needed to accomplish my dream. Thank you! My postpartum experience was so much better than that of my past epidural experiences as well. After spending time with my baby, (this hospital was great, by the way. They gave me as much time as I wanted before they took her away to give her her first bath. And they did delayed cord clamping without even having to ask. I could not have asked for better delivery nurses) I was able to get right out of bed to go to the bathroom and get cleaned up. The nurses were surprised by how fast I was able to walk to the bathroom. The whole time I was there after the birth, I just had so much energy and didn’t want to be laying in bed at all. I also didn’t have any tearing with this birth, where I had small tears with both my other two kids. That helped my healing process SO much! It was a lot easier to enjoy the experience not having extra pain from a tear. I did experience excessive bleeding afterwards for a while, which made me feel better about delivering at the hospital rather than at home or birthing center where I really wanted to deliver. But they were able to get the bleeding under control by the next day. As soon as we got the ok on my bleeding and baby’s blood sugar, we were out of there (Saturday 3:30 pm). I, again, just really want to thank you, Fiona. 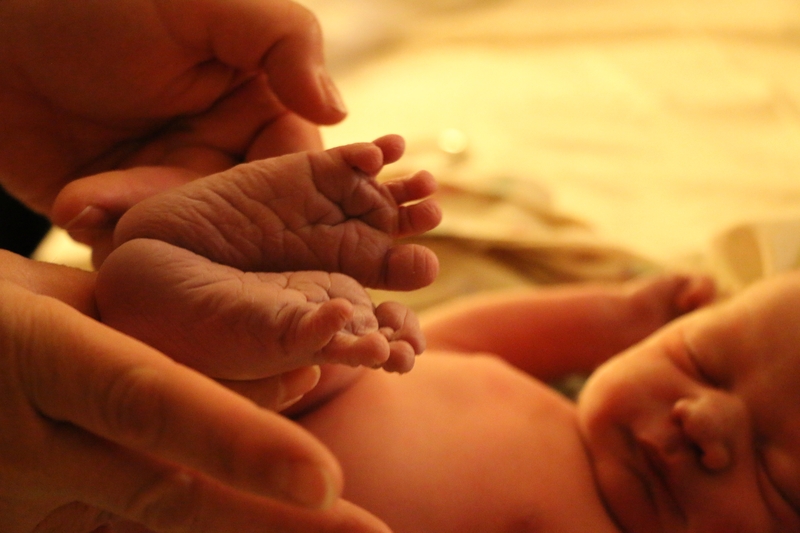 My amazing birth experience would not have been possible without your class. I will be forever grateful for you. You are a great teacher! Rick and I both sincerely enjoyed your class, learned quite a bit from it and will be referring any friends of ours who are interested in having a great hypnobirthing experience.